How do I show wall tiling in Room elevations? 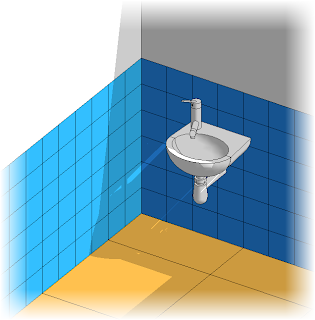 When creating room elevation of toilets or bathrooms there may be times when you want to show tiling on the walls. 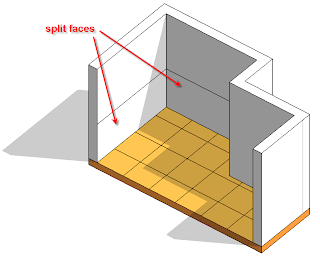 You could approach this in a number of ways, however a good start point is to use the split face tool which can be found in the toolbar across the top of the Revit UI. The split face tool can be used on any non-family instance. You can use the split face tool to split selected elements and then use the Paint tool to apply different materials to selected faces. It should be noted that you are not actually changing the structure of the element. 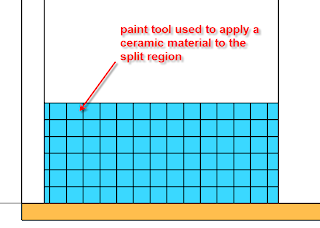 So to split the face of a wall to apply a ceramic tile material to a selected area, do the following. Select the split face tool. Place your cursor on the wall you’d like to split and select that wall face. You will now be in sketch mode, which allows you to place a closed loop inside the face or an open loop with ends that touch the boundary face. 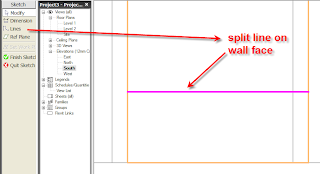 If you then select finish sketch from the design bar you will see that you wall face has been split. Next you can use the paint tool to apply a different finish to the split face. You can also use the align tool or dimensions on the fill patterns to alter and align the spacing of the fill pattern on the split face. Hi, is possible to make a pattern of 2 alternate tile colors for bathrooms elevations. I really appreciate a tutorial about this if revit can do that. This works well for elevations and 3d views, but when drawing interior elevations and tagging walls it may be beneficial for CD phase to build a tile wall type so that it has a depth and is accurate in sections as well. I typically will use a wall sweep that is of wainscot height. Works much better than adding a wall just for tile. Cheers. Agree that wall sweeps work better. If I need to add a door it heals instead of freaking out like the painting method does. There is also less mouse clicks saving TIME.